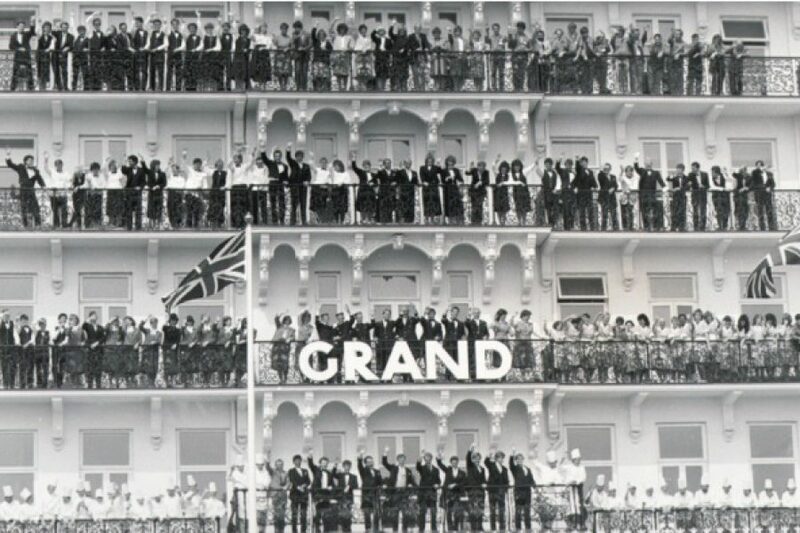 The photo above is of staff on the balconies of the Grand Hotel on the day it re-opened after the 1984 bombing. This event was the starting point for City Collective’s film installed at the Regency Town House Basement. Amanda Loomes use to be a civil engineer working in the construction industry (that’s why she knows more about concrete than most artists). Patrick Magee’s pseudonym under which he checked into the Grand Hotel in 1984 was Roy Walsh, hence Nathan Coley’s title Roy Walsh meets Patrick Magee for one of his pieces in the Portraits of Dissension exhibition at The Regency Town House. Joseph Popper made the jungle landscape which features in his installationThe Same Face by stuffing foam into a food processor and dyeing it green. The cost of building a property like The Regency Town House (where Nathan Coley’s Portraits of Dissension is being shown) ranged from £3,000 to £5,000 in the early 1800s. A similar amount could be spent on furnishings. Servants’ wages were between £10 and £65 per annum. The location for Nathan Coley’s You Imagine What You Desire, St Nicholas Church, is the oldest surviving building in Brighton. It was the town’s parish church for over seven centuries and is still referred to today as the Mother Church of Brighton. On Clifton Street near Brighton Station, we are transforming an old wood yard into a pop-up cinema. The site has been derelict for 10 years and this is a one-off project for HOUSE 2015 as the wood yard is being developed. HOUSE 2015 is supported by 44 volunteers who invigilate the exhibitions, talk to visitors, help with the installation process and ensure the security of the work. They are integral to the running of HOUSE every year and we value their contribution immensely! Judy Stevens and Chris Lord love art so much one festival wasn’t enough, so as well as running Artists Open Houses for 10 years, they decided to set up HOUSE 7 years ago.